Twenty years ago, I was finishing up the final weeks of my sophomore year in high school. I had a stupid hair cut and I loved hip-hop music. 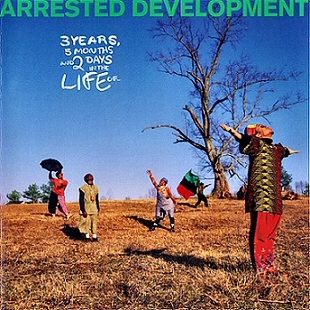 At this time a new album hit the scene -- Arrested Development's 3 Years, 5 Months, & 2 Days in the Life of. 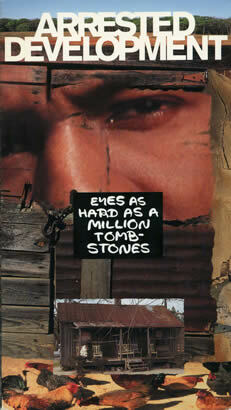 Released twenty years ago today. Tennessee was the first single and I got my grubby mitts on the cassette as soon as I possibly could. I played that thing as much as possible -- most notably on my Walkman on a spring trip to Six Flags St. Louis. That summer I turned sixteen and along with the right to share a car with my older brother, I also got my first CD player. Taking some birthday cash to the local record store (aka, Wal-Mart), I picked up my first three CDs -- Black Sabbath's Paranoid ($5), The Monkees' Pool It ($5), and the relatively new 3 Years... from Arrested Development. I'm proud to say that two of these three still remain in my CD collection. Unfortunately, the Monkees CD was sacrificed to a game of "let's scratch the crap out of this CD on the wall and see if it'll still play." It takes a lot in a musical artist for me to keep up with them for more than a short while. Arrested Development, I've stayed with for twenty years. While my music collection has grown by leaps and bounds over the past two decades, the number of Arrested Development CDs found within has multiplied as well. There they are sandwiched between the gospel goodness of Carolyn Arends and the ear-splitting madness of Atari Teenage Riot. Even the handful of VHS tapes that I still have around is well stocked with Arrested Development. Heading into my senior year in high school, I wound up with (what I considered to be) a pretty cool Arrested Development shirt. That's me sporting my sweet shirt in the picture below taken from my senior yearbook. 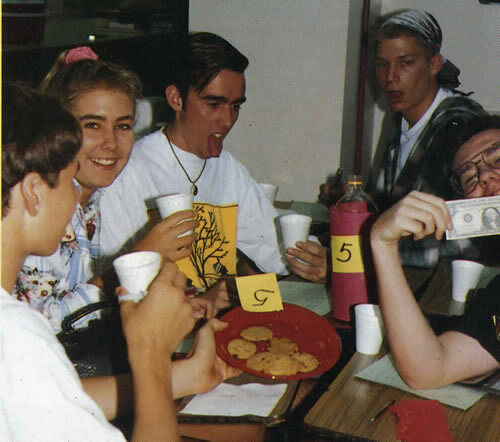 I think we were taking part in some sort of a taste test in Consumer Education class. Yeah, cool hair. I know. Surprisingly, this shirt lasted almost twenty years before being turned into art in my basement just a few months ago. I realize that Arrested Development is considered by many to be a one-hit-wonder, but good music is not about popularity. In fact, I'd venture to say that the more popular music becomes, the worse it is. Arrested Development appeals to me on a spiritual level (really) coming from the genre often described as "life music." It's fun and positive hip-hop from a time before that style turned into the garbage that sells today. With a CD I ordered once, I also received a poster signed by Speech -- signed in a unique way that I think of often. But let me tell you how much I really loved Arrested Development. 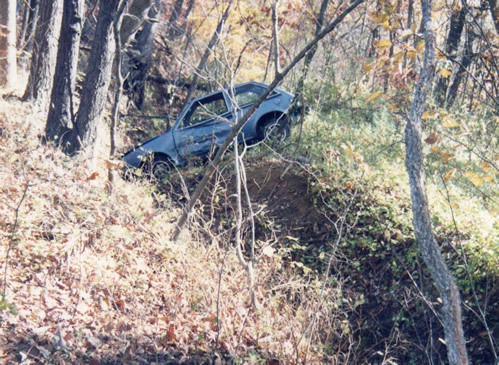 On a Saturday night back in the fall of 1992, my friends and I were on our way home from a long evening of playing basketball when we were involved in a pretty nasty single-car accident on a rural highway. All four of us were able to make our way up through the trees and to the nearest house to call our parents. As we waited for their arrival, we were clearly shaken, but I remember the television being on and Arrested Development performing on Saturday Night Live. Here's the kicker. All these years later, a friend who was in the car that night tells me that the TV was on at my request. Seriously. I had just been in a car accident. One friend had a broken ankle. We all had a good amount of black eyes, bumps, and bruises. But I wasn't about to miss Arrested Development on SNL. I can't decide if that's ridiculous or awesome. So anyway...here's to 20 years. Stay thirsty, folks. Stay thirsty. Wow! I haven't heard Tennessee in almost 20 years! I wasn't really into them as I only know Tennessee and Mr. Wendal. I was also in 6th or 7th grade at the time. Jason -- You wouldn't think my hair cut was awesome if you knew how much hairspray I had caked into it! I hope Speech gets to read this.